Don Nice, ranch hand and football player, outdoorsman and teacher, tough guy and lover, was always an artist at heart. His enduring love for the environment was nurtured in California's San Joaquin Valley, where his father worked for a fruit company, and his grandfather, a physician and gold miner, regaled him with tales of cowhands and '49ers, stagecoaches and train robbers. When he wasn’t in school, Nice himself grew up on the range – a sunburned teenager in chaps, herding cattle, dodging rattlesnakes and setting out barbed wire. "I became acquainted with the world,” he says, “from the saddle on a horse or the leather of my boots: slow, steady and in a focused way in which survival could depend on your familiarity with the land." The American land would remain central to his oeuvre. Nice starred as an athlete in high school. There were no art classes, and no museums to visit. But Don loved to draw. His grandfather and his aunt, both amateur painters, encouraged his interest; his father made him a little studio in the back yard, and he signed up for correspondence courses in art. After high school, Nice’s undeniable talent got him accepted at Art Center School (now the Art Center College of Design) in Los Angeles. But it was his prowess on the football field that won him a full four-year scholarship to the University of Southern California where he earned a teaching certificate and took art classes at night. After the Korean War, Nice volunteered for the draft, gaining education benefits from the GI Bill. He spent two years in the United States Army at Fort Ord on the California coast as a company-level illustrator, cheering his fellow soldiers with a twenty-four foot mural of potato peelers in the mess hall. 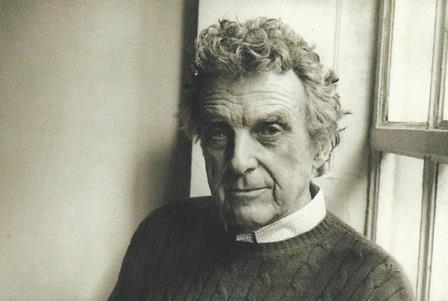 He also taught art at Monterey Peninsula College, and exhibited at the Carmel Art Center, where an important collector, Helen Potter Russell, took an interest in him and exposed him to the work of van Gogh. With one of many artists he met in Florence, Nice puttered around Europe on a Vespa, landing briefly in Salzburg in 1958 to study watercolor with the brilliant master of expressive brushwork, Oskar Kokoschka (1886-1980). The class was a revelation. Kokoschka proclaimed that it was “about painting, not paintings,” and demanded his students produce four watercolors an hour, eight hours a day, painting directly -- from the heart, not the head. When he found Nice sketching, he confiscated his pencils, exclaiming, “We are here to paint!” Nice left with a cash prize and a new vision. Kokoschka, he maintains, taught him how to see. Nice used the money to go to Paris. There, he encountered the groundbreaking exhibition The New American Painting, curated by Dorothy Miller from New York’s Museum of Modern Art. Nice was exhilarated by the scale and artistic possibilities he saw in abstract expressionism -- in the gestural bravado of Willem de Kooning and Jackson Pollock’s startlingly original canvases, with no point of perspective and no definable ground. New York was the center of art now; he could no longer stay in Europe. Back home in the United States in 1959, Nice taught Painting and Design at the Minneapolis School of Art. In 1962, at the age of 30, he was accepted at Yale’s celebrated Graduate School of Painting. At Yale, it was Alex Katz who really spoke to him, encouraging his students to be inventive, artistically informed and deeply self-aware. And to “get subject matter back into painting.” Fellow students included Chuck Close, Nancy Graves, and Richard Serra, all grappling with finding new directions. In 1963, Nice started painting larger-than-life American motifs based on labels and ads, such as Sunkist, or Starkist (his father had worked for a fruit company). These images filled the canvas, without perspective or perceptible light or shadow, and emphasizing the flatness of the picture plane. In 1966, teaching summer school in Minneapolis, he began to paint isolated objects, striving for clarity above all. He painted huge beets and gargantuan onions. He wanted his work to be true to experience and materials, to be instantly accessible, without ambiguity. He eliminated background, working directly on unprimed canvas – allowing viewers themselves to provide context. “Getting rid of the background freed the object,” he said. “I wanted a still life that really had energy.” He wanted to create “a new sensibility,” to engage people, to show them how extraordinary the ordinary truly was. He continued to paint single American images – a lobster, an eagle, sticks of gum, apple pie, reaching through the specific to the universal. And in 1968, his work was included in Realism Now, a seminal exhibition at Vassar College on the burgeoning realist movement. He was evolving, finding his own unique voice. The same year, when he bought a toy fire truck for his son, the boy asked him, “Where is the dirt, Daddy?” It was time to get his family out of the city. Nineteen sixty-nine brought sea changes. The Nices moved to Garrison, New York, to an elegant rambling old house with a long front porch facing the Hudson River. Nature was at Don’s doorstep, and the connection was immediate and profound. Tragedy struck the same year: his older brother Hubert, a botanist, died from inhaling insecticide. Don found himself increasingly aware of the fragility of life. He found it impossible to look at nature without considering the effects of toxins on what he saw. The Hudson flowing at his feet was filthy; the wildlife that was its beating heart was threatened. Nice’s neighbors included environmental writer and activist Bob Boyle, Pete Seeger, and John Adam, who would later head the National Resources Defense Council. The environmental movement was being launched in his own back yard. But for Nice, the environment was not a question of politics or proselytizing; it was “a matter of life and art.” The animals of the Hudson Valley became iconic motifs in his work – bears and blue jays, squirrels and trout, robins and butterflies and coyotes. He could no longer paint them without thinking of their value and their fragility, and the preciousness of the earth. In the 70s, he continued painting monumental single images, including, in 1975, a buffalo for the United States Bicentennial. Not judging, not looking for a reaction – just presenting these iconic motifs for us to meld with our own sensibilities and experience. In 1964, Nice had constructed an Object Box of four stacked cubes, inspired by block towers built by his toddler son. Each side had a single image. The blocks could be displayed in any configuration. Lined up, they made a series of images which reminded Nice of predellas he had seen in Europe -- supports for Renaissance altarpieces, in which a series of iconic images enhanced the theme of the larger religious painting above. In the late 70s, he started using American motifs in predellas – Coke bottles, Tootsie Pops, hunting caps, wrens. Some predellas stood on their own, each a procession of evocative floating images; others were portraits with objects that evoked the essence of a particular individual or event– a tennis player, a fellow artist, a festival at Lincoln Center. Some appeared below much larger images; some were larger in relation to a single image above. Predellas even became enhanced American altarpieces, with central images of specific sites on the Hudson, or in upstate New York, or in Alaska, surrounded by a border of fruit or flowers, with a triangular pediment above. The accumulation of images turned out to be an especially rich avenue of exploration, further enhanced by swags on either side. Zig Zag Cornucopia of 1981 epitomized the riches of the Hudson River Valley, formally arranged around a square painting of what had become the quintessential view of the Hudson Highlands near Nice’s Garrison home. 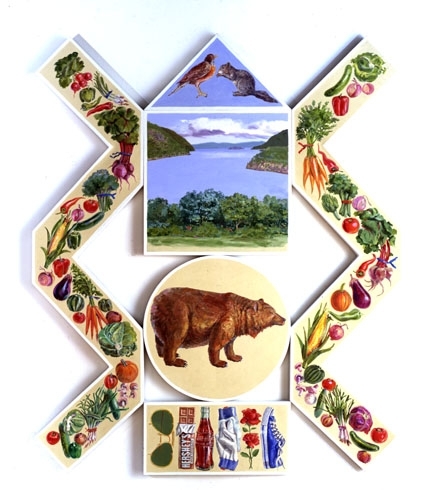 Along the bottom, a rectangular predella of six images includes a sneaker, gardening gloves, a Hershey bar and roses; above is a tondo, or round painting, of a brown bear, and, at the very top, a triangular pediment incorporating a squirrel and a robin. Vegetables grown in the Hudson valley tumble down zig zagging ribbons on either side. The amalgam of shapes in itself is mesmerizing, the spaces between them adding further interest. Nice would pursue this line of thought throughout the eighties, sometimes with the spaces literally empty, sometimes, filling them with neutral areas of paint. Nice had also explored other ways to incorporate multiple images in a formally satisfying whole. He looked to unexpected sources, such as heraldic emblems, and Native American totems. The resulting forms ranged from American Ziggurat #2, with nine square images arranged in decreasing rows, to Peaceable Kingdom of 1978, over 9 feet tall and 36 feet wide, comprised of 50 individual watercolors on either side of a large central acrylic painting with images of domestic animals -- a sheep, a pig, a chicken, cattle, a dog. Peace is the watchword of many Nice paintings, for his individual images are often still, as if waiting for us to contemplate, engage, and observe. Nice was by now deeply committed to a vision of environmental harmony and integration, recalling the 1960s philosophy of James Murdoch, who saw the earth as Gaia, a super-organism. The dramatic Hudson Highlands, with their transcendent natural beauty, profound historic resonances and views painted for centuries, often came to represent the earth. In 1985, Nice had set aside time to concentrate on his profound and enduring bond with the Hudson, whose deepest channel was just a mile upstream from his Garrison home. “I felt this need to embrace it and to come to some understanding of my own relationship to it.” He wanted to reconnect with spontaneous watercolor too. He spent two weeks following the great river, from its source in Lake Tear in the Clouds high in the Adirondack Mountains, over 300 miles, all the way down to New York Harbor. The result was over 90 small works, painted rapidly and directly from nature as Kokoschka had taught him so many years earlier, often executed sitting in a boat or even on a raft in a wet suit. In the late nineties, he would do another less extensive series, and again in 2013, showing the river from above. “Spinners” were another invention -- paintings on aluminum that moved, rotating on the wall to discourage viewers from any particular orientation, or even hanging from the ceiling, literally spun by the breeze. These pieces incorporated a symbolic vocabulary of elements – both abstract and realistic, which had come to appear often in his work. At first, there were four: earth, wind, fire and water; then, a fifth: gravity, sometimes represented by an apple, a nod to Sir Isaac Newton. Believing deeply in the interdependence of man and nature, Nice’s landscapes have become earthscapes, blending the natural and the manmade, abstraction and realism, painting and sculpture and movement. In painting what is in his heart, he gives us himself and what he sees, inviting us to give of ourselves in return. Joseph Conrad said that writing could provide “that glimpse of truth for which you have forgotten to ask.” Don Nice’s vision, born in the American West, nurtured in Europe, and manifested in emblems of America and the water and skies and earth of the majestic Hudson River Valley, draws us into the universal by means of the particular, demanding our attention, and reinforcing our inextricable connections to the forces of nature and the nature of the universe.